It’s pretty much a daily occurrence in my house: I take something out of the oven, bring it to the table, go back into the kitchen and do a bunch of other tasks, then frantically search around the kitchen for the mitts as the timer buzzes to tell me the next dish is done. Usually I’ve left them on the table, but sometimes on a chair, an odd spot on the counter, a shelf, back in the drawer, or one time—in the fridge (I have no idea how that happened). While some cooks prefer using a good kitchen towel to handle hot dishes, a lot of people (myself included) prefer dedicated mitts. But this is one of those kitchen tools that rarely gets much thought. So we’re going to change that in this article! Here we’ll discuss how to find the best oven mitts—what to look for when shopping, and what some of the top rated options are. You can skip right to the shopping by clicking the links in the summary table below. They’ll take you to Amazon to see the latest prices. Oven mitts seem like a simple tool, but there are a lot of aspects to consider. Which shape suits you best depends on your preferences and what sort of cooking you’re doing. Many cooks like to have a variety. 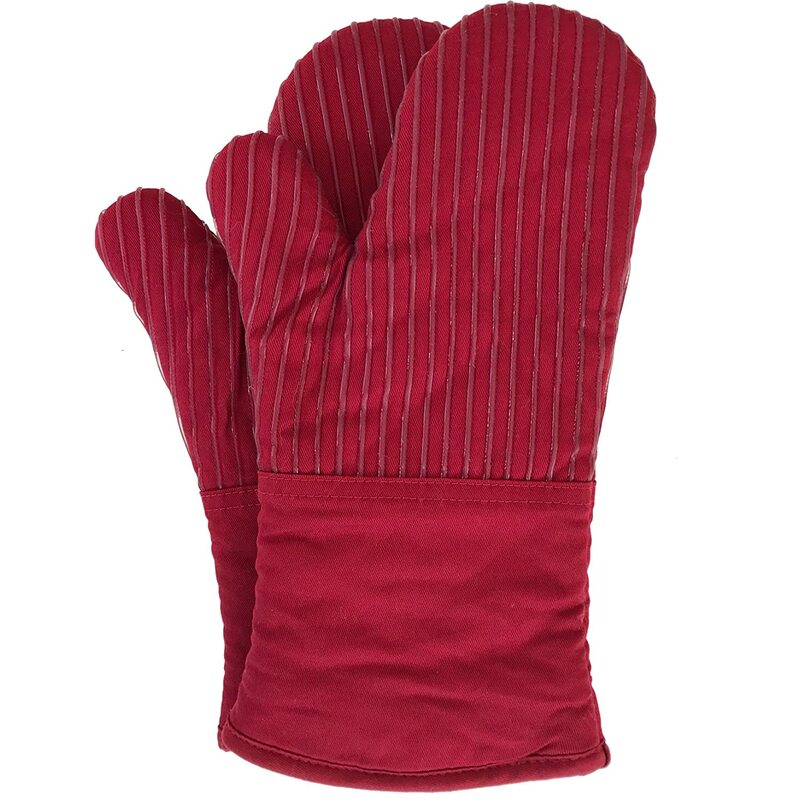 Most oven mitts are made from cotton—usually with heavy quilting on the outside and terry cloth or cotton batting on the inside. In recent years, silicone mitts have also become extremely popular, as have Kevlar and other synthetic materials. Heavy-duty camp-style gloves are often made of leather. Longer gloves that cover the wrist and forearm are the safest option, especially for handling trays or reaching deep into the oven. However, they can limit dexterity. Well, obviously, you want oven mitts to be heat resistant. But it’s something to consider—are you just quickly pulling things out of the oven, or do you have a ways to go to get from kitchen to dining table? And are you working in a very hot barbecue, or just doing routine oven work in the 375ºF range? Some gloves may be overkill depending on your requirements. Oven mitts are often marketed with a heat resistance temperature, and sometimes with a time for how long they take to heat through. I’ve tried to cover a range of top-rated oven mitts in different styles and fabrics. Here’s a rundown of these options. Big Red House is actually a wholesale soup company. After finding themselves constantly dissatisfied with oven mitts in their own operations, they designed their own “perfect” mitt. These come in red and black and have a hanging hook on them as well. 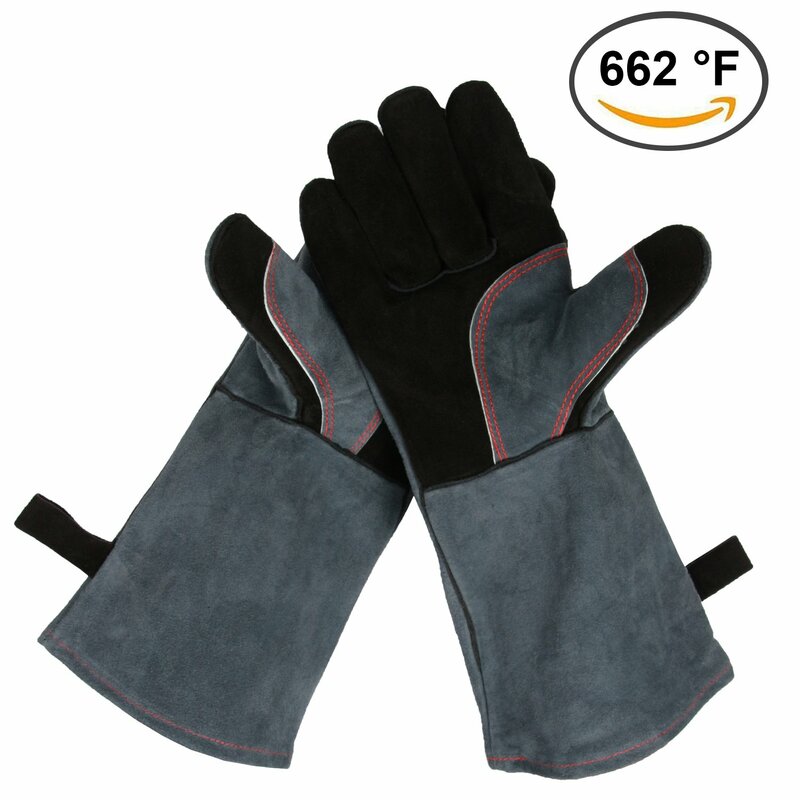 These gloves are said to combine the best attributes of cotton and silicone, providing both flexibility and grip, as well as heat resistance. The exterior is a heavy cotton with silicone stripping. The interior is polyester terrycloth, with recycled cotton batting in between the interior and exterior layers. Cooks offer high praise for these gloves. People note they are well made and feel more solid than most cotton oven mitts, but offer more flexibility than most silicone mitts. Many buyers wish they were available in more colors! Some people find them a bit too bulky, especially people with small hands, as they are quite thick. Only one buyer had issues with the quality of these gloves, but the company’s customer care seems very responsive. 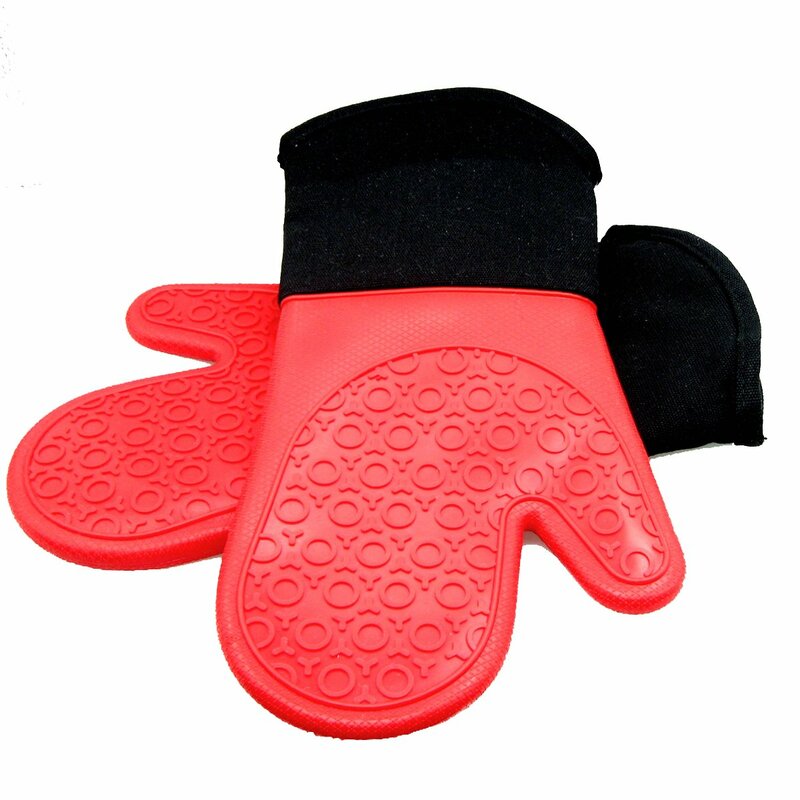 These oven mitts also combine some of the strengths of both cotton and silicone. The main part of the exterior is mostly silicone with a grippy pattern, while the inside is a a cotton-poly blend for softness and added heat protection. They are available in red, black, royal blue, and turquoise, with an extra-long version available in red as well. There are many positive reviews on these oven mitts. People find they are waterproof enough to pick up jars out of a boiling canning bath. Positive reviewers find these are comfortable and flexible, but still very effective at resisting heat and providing protection from burns, especially with the comparatively long forearm section. Most of the negative reviewers find these gloves too bulky. Some report that the interior lining is small compared to the silicone exterior, making them awkward to get a good grip with, while others find the wrist opening tight. It seems like there may be some quality control problems with these gloves, given the large disparity in user experiences. These gloves are extra long, with a 100% cotton lining and a silicone exterior in a raised, grippy pattern. They come in a bright red with black cuffs at the ends, and they are ambidextrous, so both can be used on either hand. Many cooks recommend these oven mitts. These are very long, providing a lot of protection for the forearms. People also find them to be comfortable and flexible enough to maneuver hot pans around for a long enough period of time. The majority of negative complaints are with the sizing. It seems that earlier versions of these gloves had two different size options, while they are now available in one size. Newer reviews seem to have fewer issues with the size, so perhaps the company has fixed this. One useful note I found was that the extra length of these gloves makes them difficult to put on over a bulky sweater or sweatshirt. Some people also find that the length makes them prone to slipping down. These 5-fingered gloves offer extreme heat resistance as well as protection from cuts from knife work due to the use of high tech materials like Kevlar, Aramid, and Nomex. They have a soft cotton-poly interior lining and silicone grippers. They appear to be reversible, so having the correct hand wouldn’t be an issue. 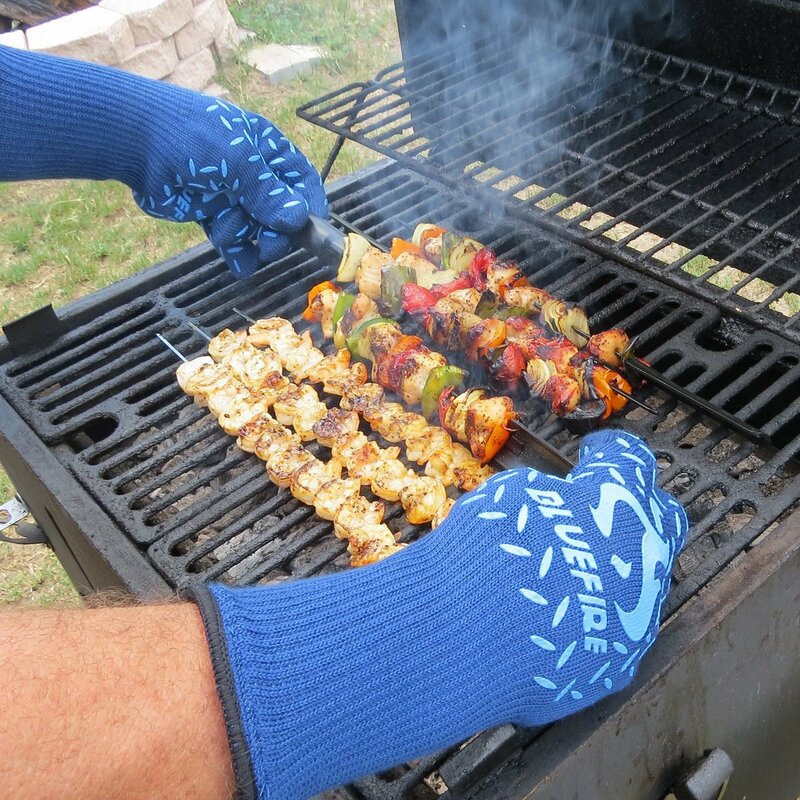 These Blue Fire gloves offer a longer forearm length than other gloves like it, which gives a bit more protection for reaching into the stove or barbecue. Many users love these gloves and say they’re the best they’ve tried of this style of glove. The 5-fingers offer a lot of dexterity, especially when reaching into the oven or BBQ to flip food or add seasoning. Sizing issues seem common with these gloves, which is probably a bigger factor in 5-fingered gloves generally: some find them too tight, some find them too big. In response, the manufacturer now offers men’s and women’s sizes. Another issue is that liquids can get through and will lessen the heat resistance of these gloves, and they can be difficult to clean. Some owners note that these gloves are trickier to get on than a mitt-style of glove. The Ove’ Glove is one of the best-known of the high-tech, 5-finger design gloves. The box contains one glove, and you have the option of buying a heat and flame-resistant glove, or a heat, flame and steam-resistant glove. The gloves are reversible, not hand-specific. The Ove’ Glove is made of Kevlar and Nomex with silicone grips and a cotton interior. The “anti-steam” Ove’ Glove has an added latex layer for protection against moisture, but note that this glove has left and right versions. 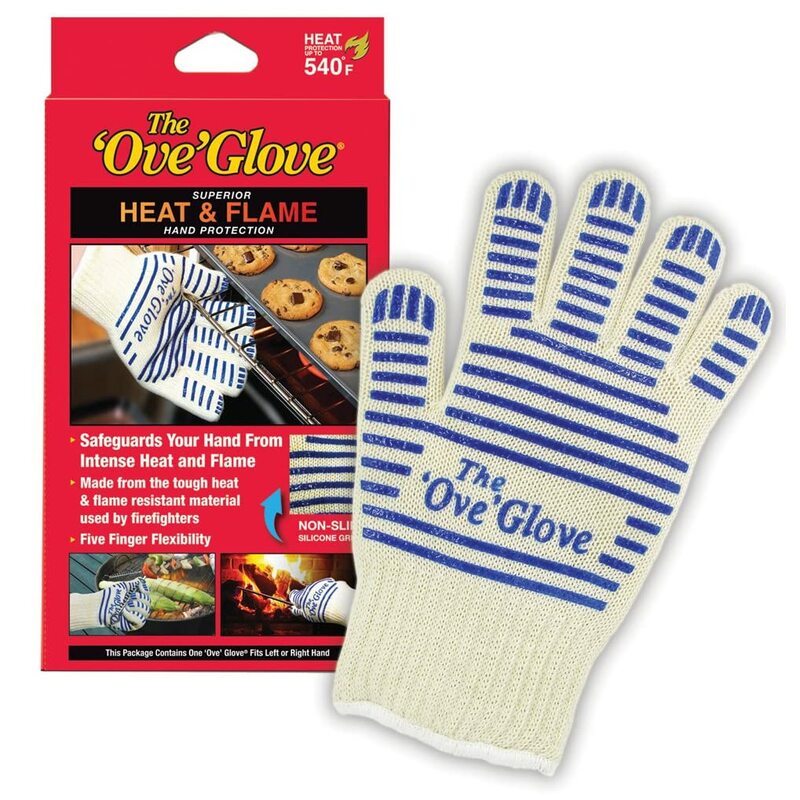 Plenty of buyers are very happy with the Ove’ Glove for many different uses such as canning and camping. Many reviewers note that these stand up better compared to other styles of these gloves. The primary complaints are to do with the steam-resistant version. People find these stiffer and bulkier than the originals. The other bulk of negative reviews are from people who believe they’re received counterfeit gloves, so beware when ordering. These heavy-duty leather gloves are marketed for grilling and outdoor use, but I think they’d make great kitchen oven mitts as well. These are made of heat-resistant leather with a cotton lining. They are very long, so they cover well up the forearm. The rough leather exterior provides grip and wear well. Most people who own these gloves use them outdoors but note that they would made excellent indoor gloves as well, such as when handling cast iron pots and pans. People find they are substantial but still work when picking up small items. I like the idea that they will hold up well—no cracking, shredding, punctures. The main complaint with these is that they are big. People with smaller hands may find them too bulky for everyday kitchen use. Is there one perfect oven mitt? I’m not sure, but there definitely are a lot of excellent options. I personally like a soft oven mitt, so I would be interested in the Big Red House Oven Mitts. I like the combination of soft cotton and silicone grips. If you like the water resistance of silicone, a cotton lined option like the HOMWE Silicone Oven Mitts with Quilted Cotton Lining would work well. I also love the feel of leather and the way it ages, so the Ozero BBQ Leather Gloves would be a good option, especially for handling my favourite cast iron pot and while grilling. 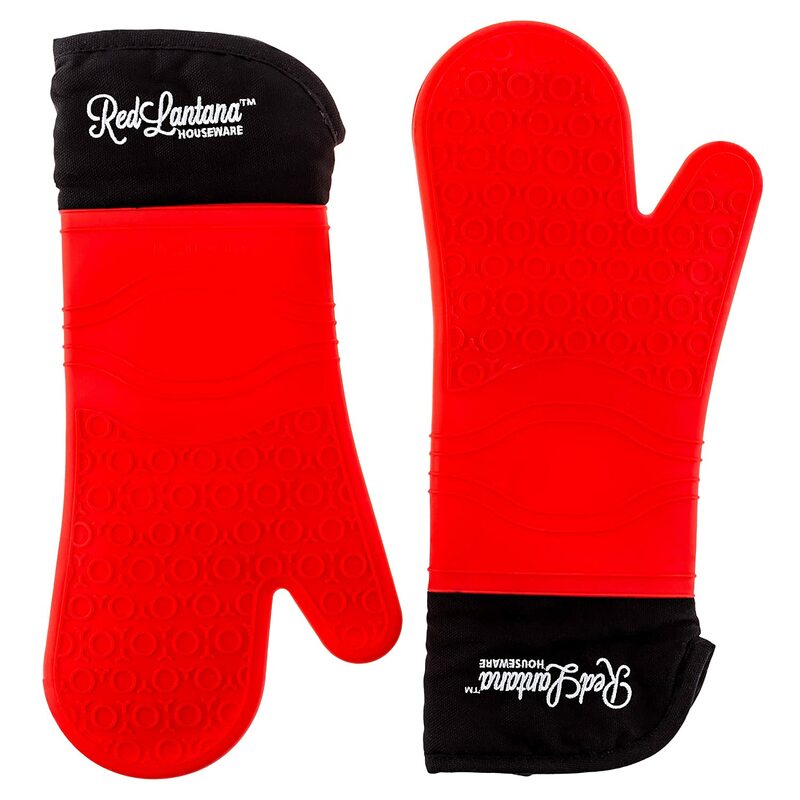 If you’re into silicone oven mitts, the Red Lantana Silicone and Cotton Mitt Pair seems like a solid option that offers a lot of forearm protection. The Blue Fire Pro Oven Glove Pair is a good choice for 5-fingered gloves, and I think the longer forearm protection there gives it a slight edge over the well-known Ove’ Glove. What style of oven mitt do you prefer? Let us know in the comments! All the Awesome Recipes and Sides for Your Egg Plant Parmesan!